Give your child the eTutorWorld advantage and help them to not only master valuable skills such as math but also have the confidence required to succeed in grade school and beyond. Let your child learn from our highly experienced math tutors for all grades 3 to 12. The math tutors at eTutorWorld are highly qualified and experts in their field, armed with certification and decades of tutoring experience. Division is breaking a number up into an equal number of parts. Division is repeated subtraction. 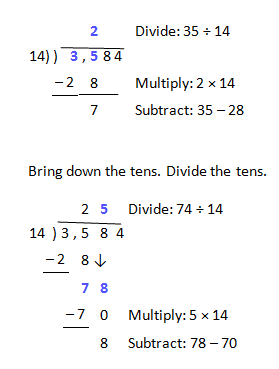 The terms used in division are dividend, divisor, quotient and remainder. The number which is divided is called the dividend. The number which divides is called the divisor. The answer which is the result of the division is called the quotient. If there is any number left over, it is called the remainder. 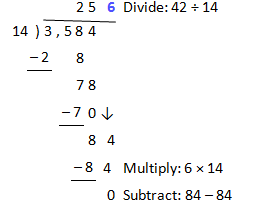 The remainder cannot be evenly divided by the divisor. Look at the first two digits. The first two digits are greater than 14. Start with the first 2 digits. Divide the hundreds. Bring down the ones. Divide the ones.